Body Positive Yoga is inclusive for all. it’s a welcoming and supportive place for people who experience identify as fat, or have chronic pain, illness, or have found other Yoga Studios did not cater to you. We have a lovely LGBTI community and welcome you whatever your orientation, injury, level of ability or level of experience. We are different to all other studios. We are trauma aware and compassion focused. We live these values. Our teachers are all different but, but we all have the same values. Arriving on on time is key, due to relaxation starting a couple of minutes past the hour we cannot allow people in after that. Wear anything you like which is comfy and you can move in. 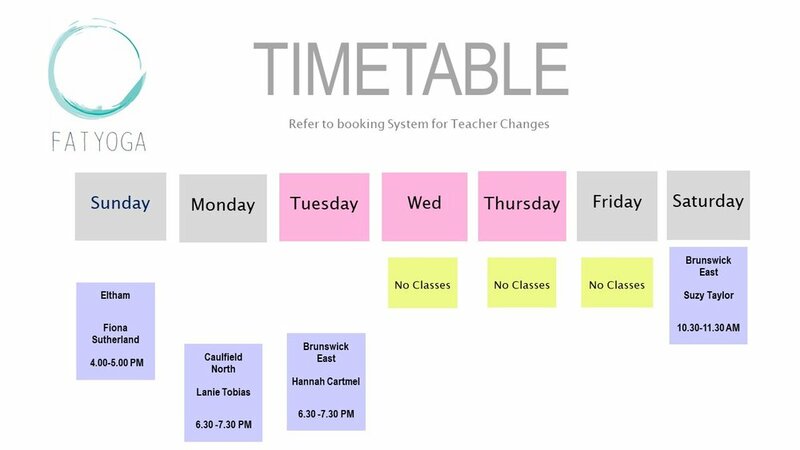 Our teachers know bodies change week to week as do energy levels and so need to know if there is anything they can do help support your experience or your body for the class. Make changes to your class up to 48 hours in advance via the ap below. Class passes have expiry periods. 100 days for 10 pass, 50 days for 5 pass and 14 days for single pass. These are one of the longest times in Melbourne! Have fun! Yoga is a beautiful accessible practice in our spaces.